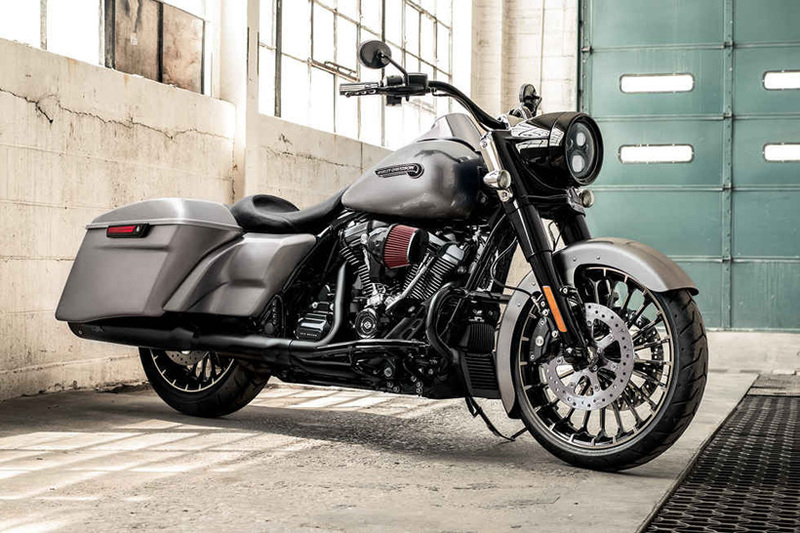 The all-new Harley-Davidson 2017 Road King is another example of the best cruiser bike, newly launched by Harley-Davidson Brand. This bike has got the powerful engine that offers the maximum performance with class. The bike has robust and better chassis that has the best color combination. The design is also mind blowing. The seat offers the maximum control, comfort for the long ride and better look. The tires and wheels provide excellent grip in all road conditions. 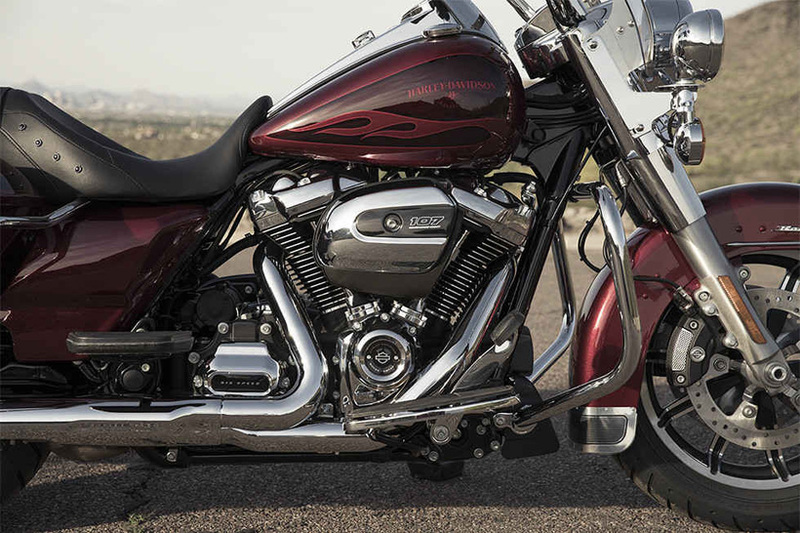 Each and every part of this bike represents the legacy of Harley-Davidson brand. The review of Harley-Davidson 2017 Road King with price and specification are written below. The all-new Harley-Davidson 2017 Road King comes with the great 45-degree V-Twin engine rings that offer the best performance. The engine is durable and has an intense look. This bike is an icon for the next generation of Harley-Davidson Bikes. The engine has superb displacement. Power and has rigid transmission for the smooth ride. The engine consumes the less fuel and delivers more displacement and horsepower. It has got the new aluminum heads and 12 volts of an electrical system, carburetor and easily adjustable timing system. This new regime helps in better circulation of oil and roller bearing on the crankpin helps in reduction of weight. The temperature of the engine is maintained by using the air cooled system. This engine has easily removable heads for serviceability. This engine is specially designed for more speed, power, and stability. This bike has the most powerful and coolest engine Harley-Davidson Brand has ever made. It has got the Milwaukee-Eight 107 V-Twin smoother, stronger and durable engine. Four valves per cylinder, single chain driven cam, counter-balanced, dual spark plugs and rubber mounted. MORE POWER: larger displacement, 4-valve heads and the higher compression ratio that produces 10% more torque. QUICKER ACCELERATION: 2-3 bike lengths faster from 0-60mph, 1-2 bike lengths quickly from 60-80mph in the top gear. IMPROVED FIT: Narrow original and optimized shape of an air cleaner. REDUCED VIBRATION: New internal single counter balancer provides a smoother, more refined feel at idle. 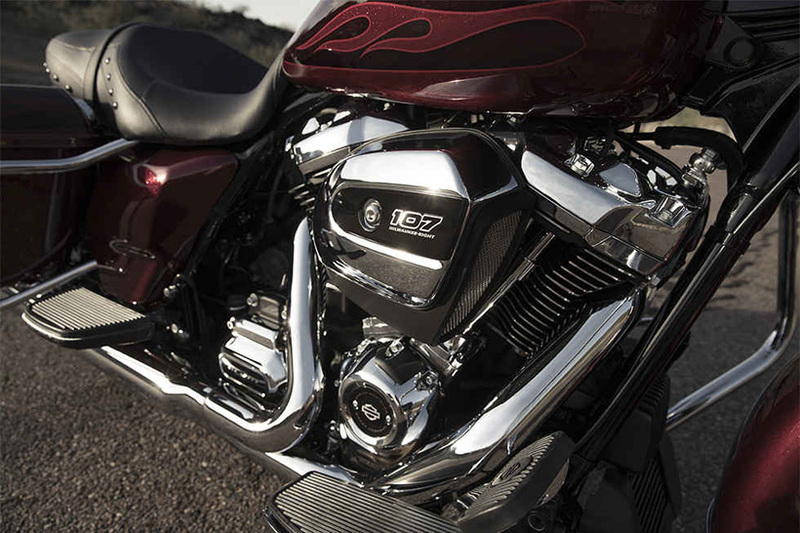 RICHER EXHAUST NOTE: Less mechanical powertrain noise that allows more iconic V-Twin rumble due to its lighter valves, optimized cover designs, and driveline improvements. LOWER IDLE SPEED: For better sound and less heat. IMPROVED CHARGING: 50% more output to meet the increased touring accessory needs. The all-new Harley-Davidson 2017 Road King offers maximum control to the rider. This bike features the dual halogen headlamp and the halogen fog lamp to match the need of an hour. This head light provides best quality lights better than the previous models. The cornering with this bike is very smooth. So don’t worry about the sharp turns. The steering dampers also control the feedback from the road. It has got the best tires that offer stability and monitoring. The rear tire is 180 mm wire that fits in the rear fender and provides best grip. Dunlop Multi-Tread technology that has the harder compounds at the center of the tire and softer on the sides of tires. This new technique provides the best performance of bike on every stretch of road. This bike has got the new dual bending valve front and rear suspension with easily adjustable emulsion shocks. These shocks provide more comfort, better control, and confidence in handling. The new rear shock offers 15 to 30% more pre-load. They adjust by only turning the single knob; no special tool is required. The new and bigger pistons offer more area for improved damping performance over the range of suspension travel. This new technology of fork enhances the ride on bumps of the road. This bike uses the Linked Brembo Brakes with the ABS. ABS turn a locked-up front wheel or the rear wheel skid into the relic from riding’s history. The front and rear brakes are electronically linked to offers the right amount of braking force to each tire. This bike has the air adjustable suspension as a standard; the rider can accommodate the heavier or lighter payloads. The lighter the load, the softer rider can go by reducing the air pressure or by increasing the air pressure for the more firm ride. The convenient air valve is located between the saddlebag and the rear fender for quick adjusting. The bike has the 6-speed cruise drive transmission that provides the smooth, shifting and it reduces the engine speed on the highway. The new Harley-Davidson 2017 Road King comes with the excellent look and performance without sacrificing the style. It has a deep bucket and narrow neck with the touring saddle bad. It has the best seat that can accommodate a wide variety of rider sizes. The seat has the lower height of 26.5 inches and is ergonomically perfect. The bike has the full-length of footboards that have a rubber isolation for the comfortable ride, while the height-adjustable passenger boards offer comfort to the rider. The rider can only shift between the gears by using toe-shift or heel-shift techniques. The saddlebag has the feature of the one-touch opening design. 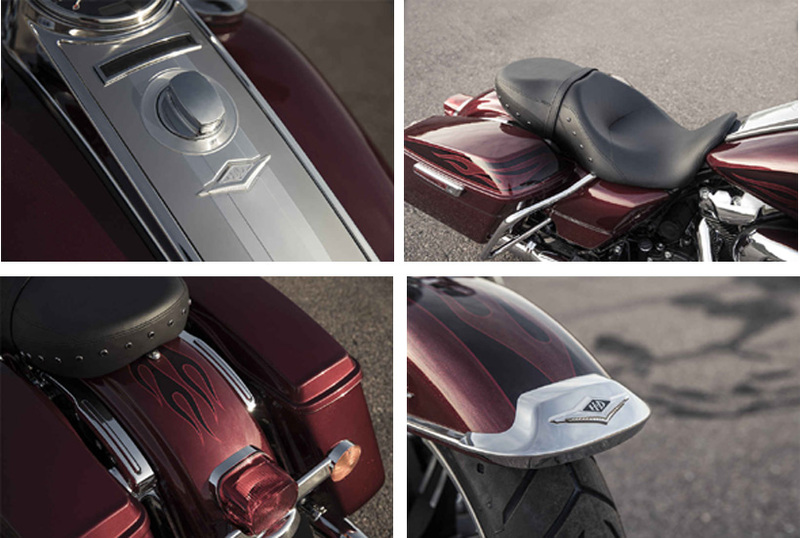 The Harley-Davidson brand preferred the saddlebag that has one-touch opening feature. The saddlebag has an impressive layout. It looks tight on the outside, but it has a plenty of space inside. The rider can store anything quickly. Just open the lid by only one touch and place your things inside. The bike has best handlebars that offer good handling experience. 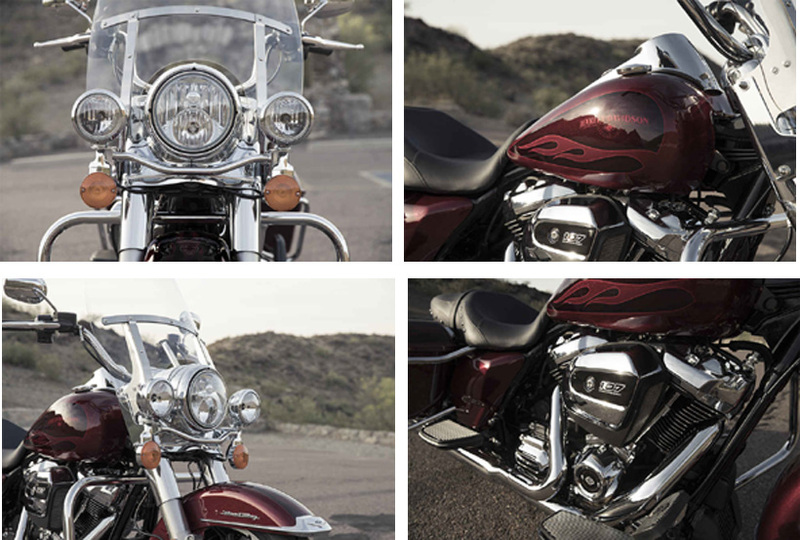 The new Harley-Davidson 2017 Road King has the broad set of handlebars that come as the standard. The handlebars are made up of durable stainless steel that ensures the structural rigidity and better look. This bike has the factory installed the next-generation security system that features the hands-free fob. The windshield of this bike is easily detachable. The windscreen has durable, scratch resistant, low maintenance. The all-new Harley-Davidson 2017 Road King has the best style and fantastic look. This bike has racing scoop style air cleaner that offers the superb look. The bike has stylish tank and fenders with the incredible color combination. Each and every part of this new bike is the masterpiece. The fuel tank has the capacity of six gallons and has premium paint. The dual-color paint scheme is used on this bike that offers elegant appearance. It has new and modern graphics with the tank mounted gauges. The rider can easily check every information on the odometer display area. It has the better headlamp that offers the classic look. It has the clear lens reflector optics that provides the longer distance high beam and wider low beam. Headlight offers the bright, striking daytime lamp that blasts the little further into the night. This bike has the 17 inch of cast aluminum, and 10 spoke impeller wheel. The rear impeller has 16 inches. This bike has a low mounted license plate. The rear lights are little small which adds the classic look of this bike. The all-new Harley-Davidson 2017 Road King comes with the number of features that makes this bike excellent. This bike has the price of $18,999. 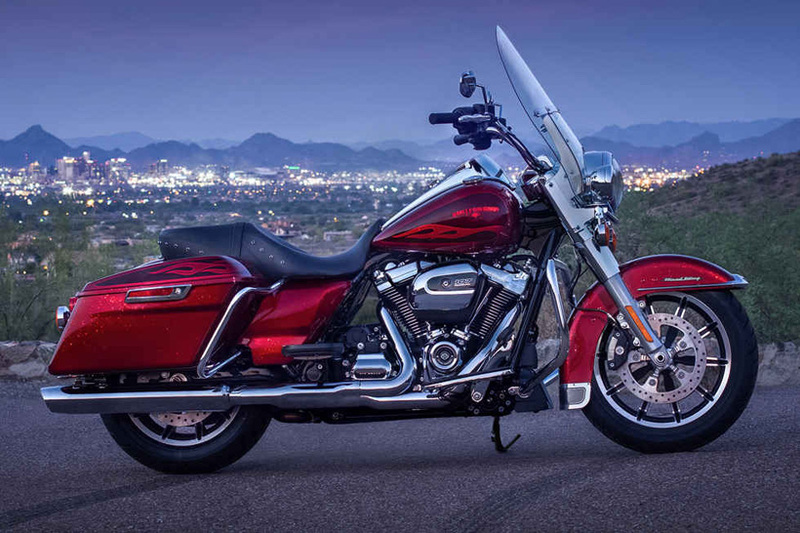 The newly launched Harley-Davidson 2017 Road King bike is the best tourer bike that offers the best riding experience. It has the best color combination along with the best graphics. It provides the more power, better stability, exceptional travel experience and superb grip on the road. So don’t be late to purchase the new Harley-Davidson 2017 Road King.